Abby Schnable | The Phoenix First-year midfielder Abby Swanson’s three goals are tied for most on the Loyola women’s soccer team with senior forward Jenna Szczesny through eight games. 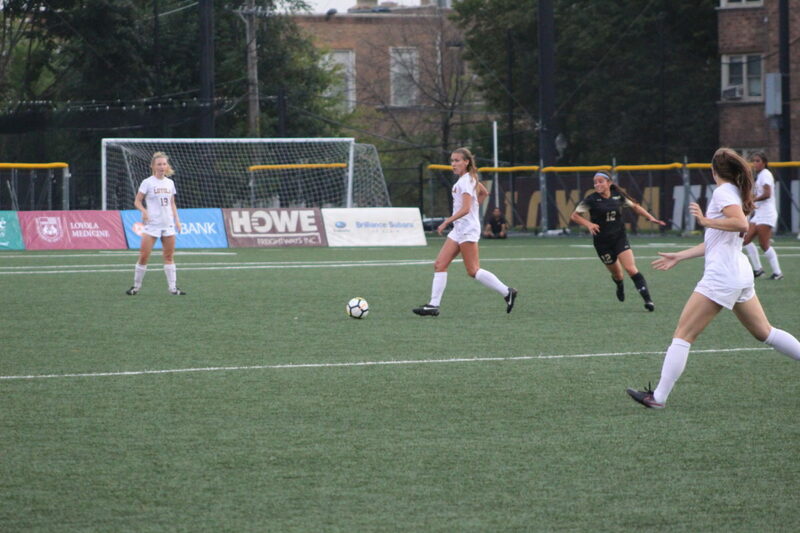 The Loyola women’s soccer team (3-5-0) welcomed six first-years to the team this year, but nursing major and midfielder Abby Swanson has started the season with a bang. Swanson said she started her soccer career in kindergarten. As she progressed, she got involved with a club team in third grade and never looked back. She played on both male and female teams growing up, then faced a setback her freshman year of high school when she tore her ACL while playing in a game. While she was injured, Swanson was a manager for the varsity team and returned her sophomore year to play again on the team. Her training was broadened to new territory when she joined a men’s club team. Swanson said she had to balance her athletic and academic goals when choosing her college. Swanson said she toured the Lake Shore Campus and met head coach Barry Bimbi on her own — without her parents. 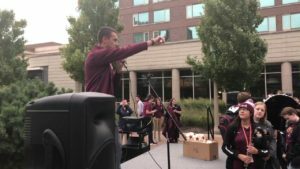 Swanson said Loyola was one of the only places where she could pursue a nursing degree and play a Division I sport, which made it the perfect fit for her. According to Bimbi, her competitive nature made her stand out during recruitment. He said it was evident Swanson is no ordinary player. Swanson said she’s beginning to find a balance between her school and soccer schedules. Bimbi has been leading the women’s soccer team for eight years now; he said Swanson’s ability to focus is what she bring out in workouts. Swanson said it took some time for her to get comfortable and open up around her new teammates. Through travelling, practicing, eating and studying around them, the team quickly got to know Swanson on and off the field, according to junior defender Madison Laudeman. With a total of 14 goals overall and two goals under her belt, Bimbi said Swanson is off to a great start to the season. Swanson said being a part of a supportive, motivating team, has helped her confidence flourish; she said this attributed to her early success. She said it’s nice to know the coaches have confidence in what she can do. “It’s about having those 90 minutes and what you can do with it,” Swanson said. Swanson and the Ramblers are scheduled to take on Florida Gulf Coast University Sept. 16 at Loyola Soccer Park.